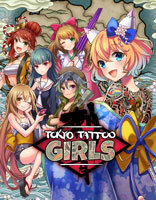 Tokyo Tattoo Girls | NIS America, Inc. Become the Tattoo Artist/The Power of Tattoos - Choose your companion character to help you escape from Tokyo, and develop her abilities by giving her powerful tattoos. Conquer Tokyo’s 23 Wards/A City to Conquer - Battle against the Union to conquer all of Tokyo’s 23 wards in the hope of escaping the city! Gorgeous Tattoo Designs - Enjoy unique designs inspired by traditional Japanese tattoo art created by tattoo artist Koji Tanaka.